I absolutely love this story so I have to share it. 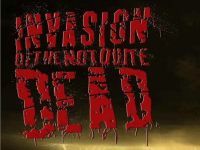 A zombie fan/nut, AD Lane, had made movie history by setting up the first tweetathon event to finance its film, Invasion of the not quite dead, in 2010. AD Lane had been seeking some more conventional financing means to no avail since 2007, so have decided to make this a fan-produced movie. And thanks to the success of the first tweetathon, he had made this a monthly event, in complete disregard for his own health and sanity. He is currently in the midst of yet another 55 hours tweetathon, about to finish in about 8 hours. I suspect at this stage of sleeplessness he must resembles one of the not quite dead characters of his upcoming project. He had already secured the support of such diverse and big names as Gale Ann Hurd (producer of Terminator), Tom Savini and Ken Russell, and the participation of Gremlins actor Zach Galligan. He had already shot a teaser as well as the intro of his film in Bulgaria which you can see below, and the list of problems he has encountered from day one, as described in his website, is absolutely hilarious. His sheer determination and passion reminds us of all that is great about independent or even guerilla filmmaking, and how a passion can transcend any obstacles. If you want to be part of this, just £10 will buy you a Download producer credit. Check out his website and see the teaser below. And follow him on Twitter @indywoodFILMS to see him loose his last remains of sanity after days without sleep.